Background: Dilation of tight or complete coloanal anastomotic strictures has a risk of potential false tract formation and anastomotic disruption. 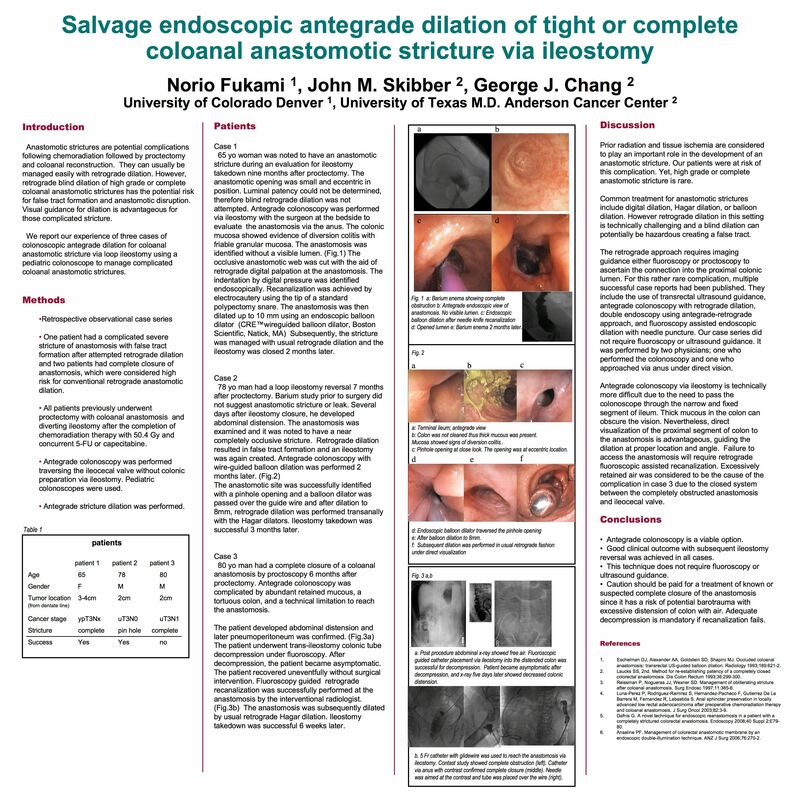 Use of endoscopic dilation is limited by alternated anatomy. Here, we report our experience of three cases of colonoscopic antegrade dilation for coloanal anastomotic stricture via loop ileostomy using pediatric colonoscope. CASES: Three patients underwent low anterior resection for locally advanced rectal cancer after the completion of chemoradiation with loop ileostomy. Case 1: 65 yo man was found to have anastomotic stricture prior to ileostomy takedown 9 mos later. The anastomotic opening was small and eccentric in position. Blind dilation was not attempted. Antegrade colonoscopy was performed via ileostomy. The anastomosis was identified without a visible lumen. With the aid of digital retrograde palpation, recanalization was achieved by cut current using the tipped snare followed by balloon dilation. Patient did well subsequently with retrograde dilations as needed and the ostomy was closed 2 mos later. Case 2: 78 yo had loop ileostomy reversal 7 months later. Several days after ileostomy closure, she developed abdominal distension. Her anastomosis was closed and retrograde dilation was not possible. Ileostomy was again created. Antegrade colonoscopy was attempted 2 months later. The anastomotic site was successfully identified with a pinhole opening. A balloon dilator was used over the guidewire and after dilation to 8mm, retrograde dilation was performed. Ostomy takedown was successful 3 months later. Case 3: 80 yo man found to have complete closure of coloanal anastomosis 6 month after LAR. Antegrade colonoscopy was attempted via ileostomy. His colon contained abundant mucus complicating the advancement of the scope. Pediatric colonoscope did not reach the anastomosis and it was exchanged to an enteroscope. Despite the prolonged effort, anastomosis was not reached. The patient developed significant abdominal distension and later intraabdominal free air was confirmed. The patient underwent colonic decompression tube placement via ostomy under fluoroscopy. After decompression, the patient became asymptomatic. The patient recovered uneventfully without surgical intervention. CONCLUSIONS: Colonoscopic antegrade dilation of coloanal anastomotic stricture is a viable option for tight or complete anastomotic strictures with good clinical outcome avoiding surgical revision and it assists in transition to ostomy takedown. Complete closure of anastomosis has a risk of potential barotrauma with excessive distension of colon with air and adequate decompression is mandatory if recanalization fails.